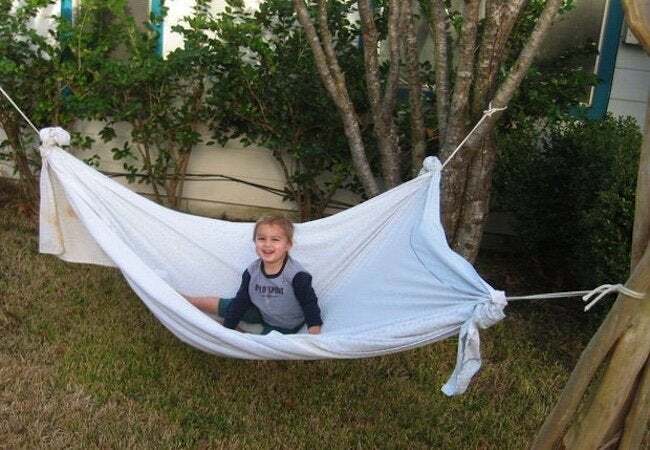 The next time you want to relax in the yard, remember that you can always rig up a homemade hammock with nothing more than a bed sheet and a length of rope. We’re always choosing between saving time and saving money. So when a DIY comes along that’s both quick and inexpensive, people tend to take notice. That was certainly the case for the Instant Hammock. Ingenious yet face-palm simple, the project drew nearly 250,000 views on Instructables and a feature in Make: magazine. Behind the sensation was Tim Anderson, who showed that in just ten minutes, using only a bed sheet and rope, you can create a backyard oasis. 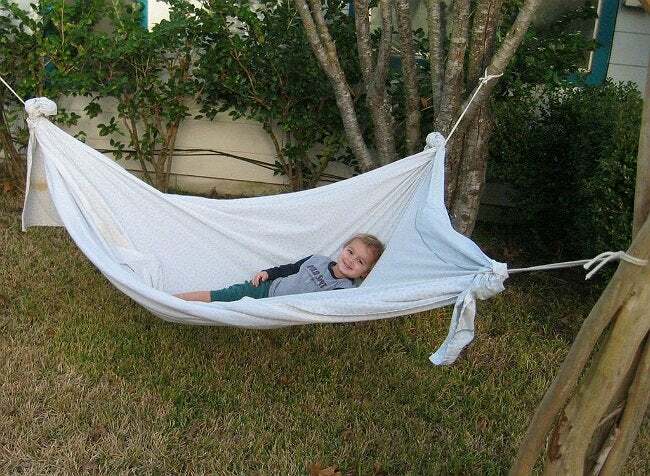 Whether store-bought or homemade, a hammock needs supports. To start things off, survey your property for a pair of uprights spaced six to nine feet apart. For a flatter, more bed-like experience, consider using a three-way, triangular setup, as shown. They don’t need to be trees, but your chosen supports do need to be sturdy. Next, get your bed sheet ready for its new role. (Note that if you’d rather not sacrifice a sheet to the cause, you can try a tarp or drop cloth instead.) Lay the sheet so that you can clearly see its top and bottom edges. Now proceed to knot the fabric, once for every support you plan to employ. Three supports? You need three knots. The last step is to hang the hammock. Using a Lark’s Head knot, fasten one length of rope to each of the two or three knotted points you made in the sheet. That leaves two or three rope ends, each to be tied to a different support. Here, too, use a Lark’s Head knot or whatever knot you feel most comfortable with. That’s it!